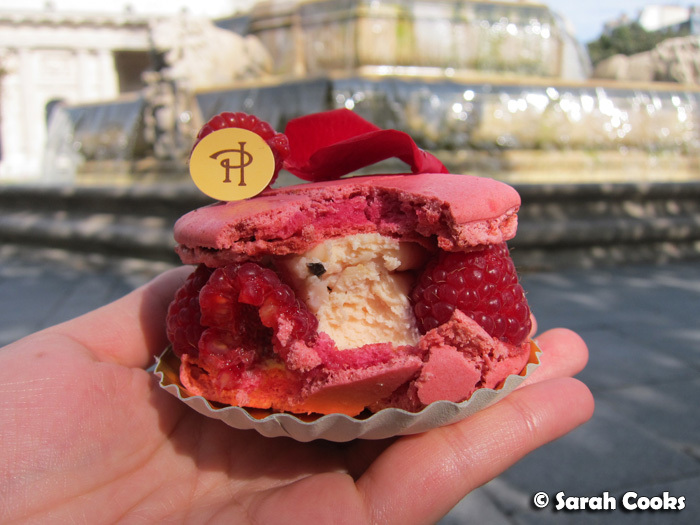 Whilst I didn't have any destination restaurants I absolutely had to visit in Paris, I most certainly had some pâtisserie destinations! 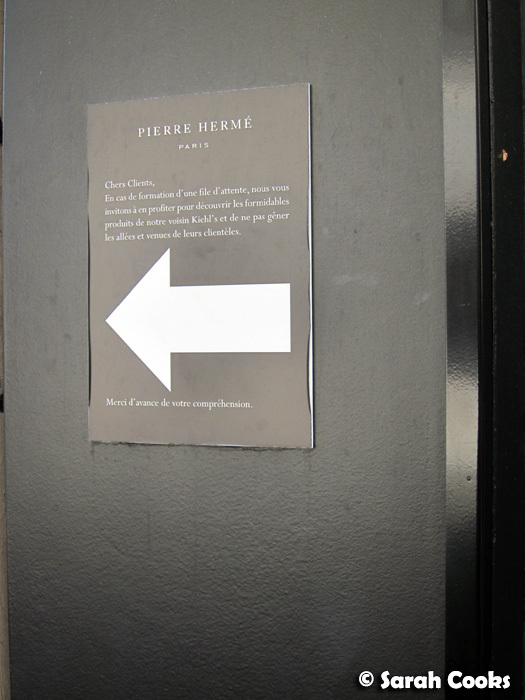 I first discovered Pierre Hermé macarons in 2006, when Clarice brought a box back from Paris to London for us to try. (Blogged here and here). 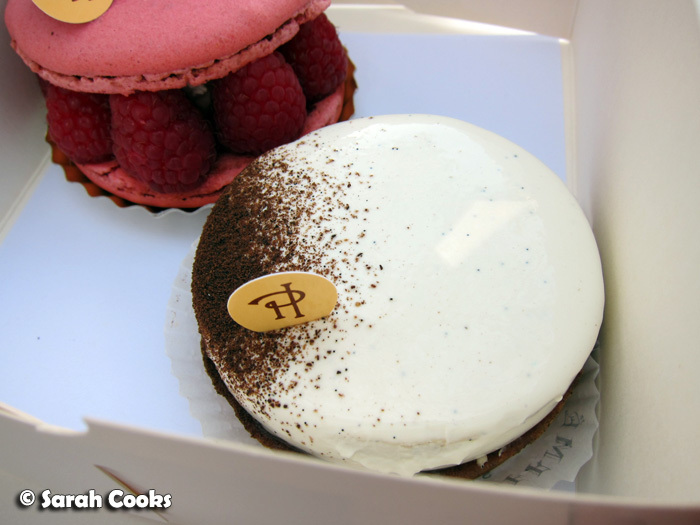 The last time my parents went to Japan, they also brought back some Pierre macarons, cakes and biscuits for me. I know, I'm a lucky girl, right? As I previously mentioned, on our first day in Paris, we visited one of the Pierre Hermé stands in Galeries Lafayette, to pick up a couple of Mogador chocolate pralines and macarons - fuel for shopping and sightseeing! 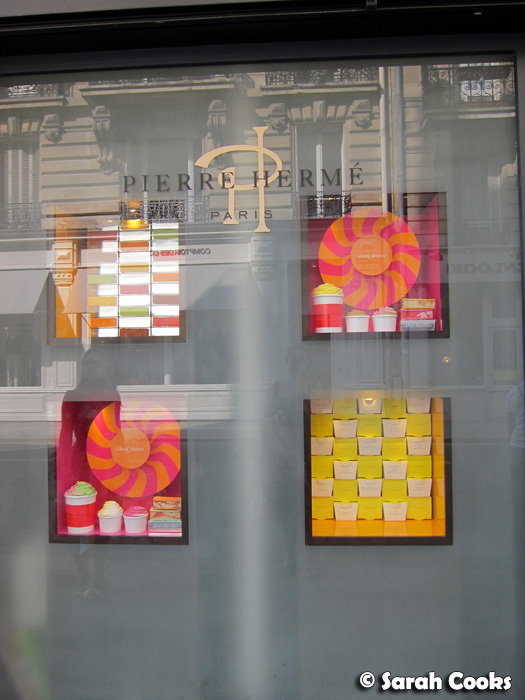 On the second-last day of my trip, Clarice and I visited the Bonaparte boutique to try some of his famous pastry creations. Usually there's quite a bit of a queue, hence the below sign asking customers to form an orderly queue, not to disturb the Kiehl's customers, and indeed, to discover the les formidables produits of their neighbour Kiehl's! 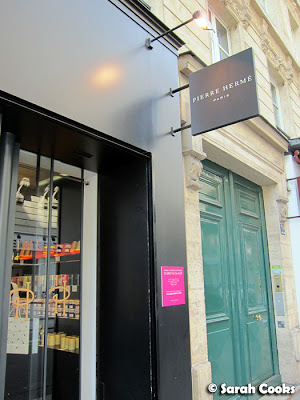 We were quite lucky in that there wasn't much of a queue at all, so we were able to go straight into the shop. To enjoy straight away, we bought an Ispahan and a Tarte Infiniment Vanille. 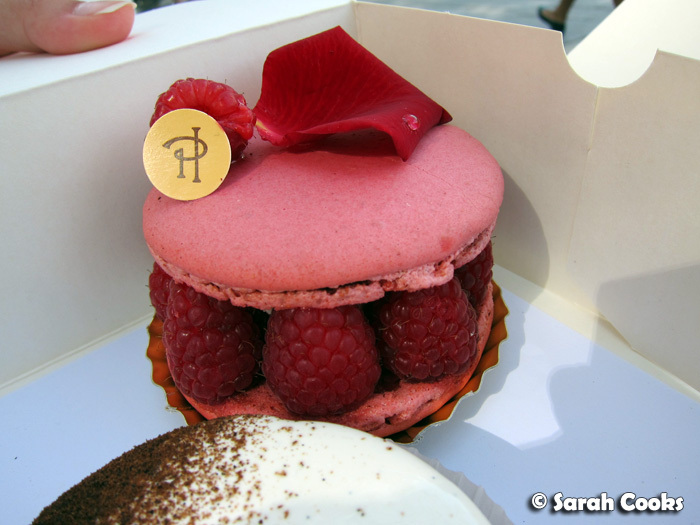 I almost didn't buy the Ispahan, having tried so many imitations of this raspberry/lychee/rose dessert before, but I'm so glad I did! Apart from looking beautiful, with its row of stunning (hairless!) raspberries and the carefully placed, perfect rose petal complete with dew drop, it just tasted amazing! None of the individual flavours dominated, but rather melded harmoniously to create an incredibly gorgeous entremet. 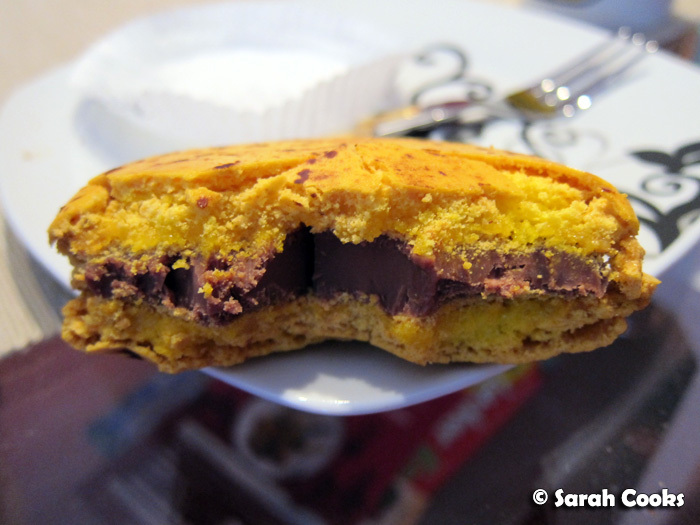 I also loved the contrast between ever-so-slightly crisp macaron shell, the soft macaron interior and the creamy lychee filling. Perfect. I can honestly say that one of the hardest culinary things I've ever had to do in my life was stop eating halfway through to give the rest to Clarice. 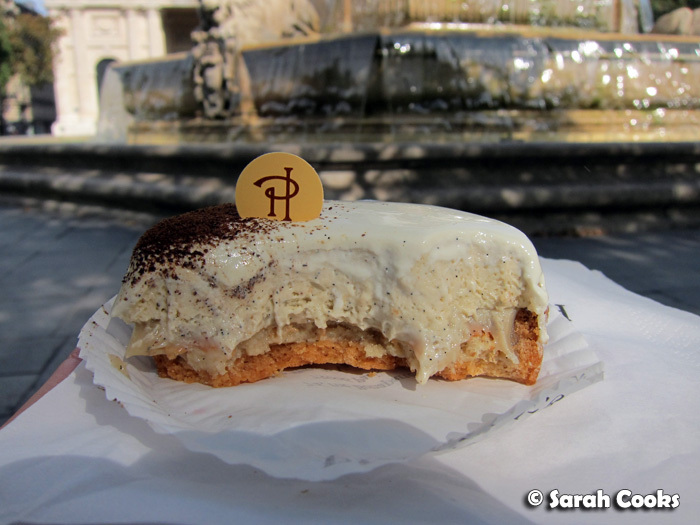 But all was not lost, because I had half a tarte infiniment vanille to console me! There are three (count them, three!) types of vanilla in this tart - if you ever thought Vanilla meant "plain", then you were wrong! Veron from Kitchen Musings made a beautiful version at home (after having been to a 2-day Pierre Herme cooking class in Chicago - JEALOUS! ), so I'd recommend having a look at her excellent post to understand all the different elements in the complex little tart. At the time, I was happy just to eat and enjoy. 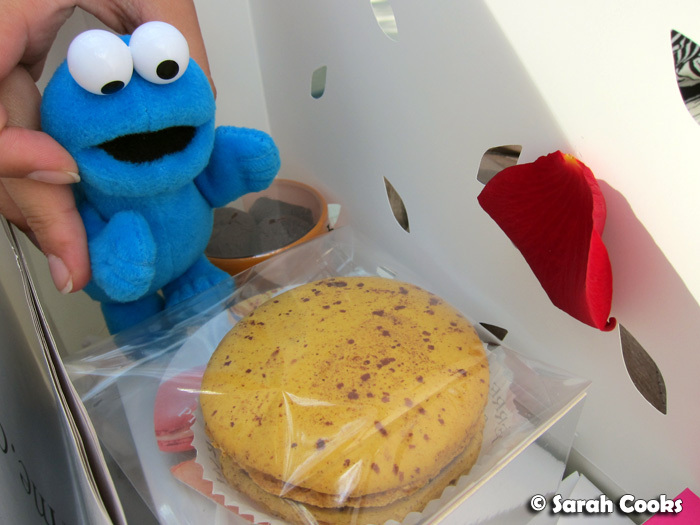 I also bought a giant Mogador macaron and an extra Tarte Infiniment Vanille to bring back to Germany, and a block of Mogador chocolate and some sablés diamants aux chocolat to bring back to Oz. Sorry Cookie, that's not for you! I ate the giant Mogador macaron 2 days after I got back to Germany. 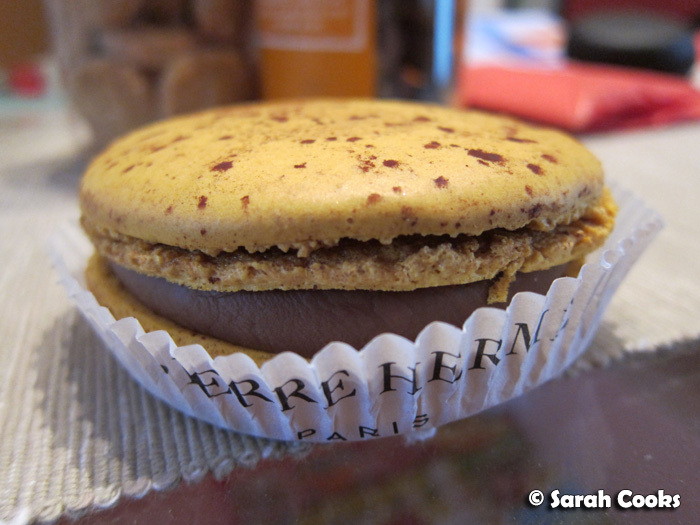 A whole Mogador macaron to myself. What a treat!!! Hahaha hairless raspberry! Did they shave it?! :P But I know what you mean. Lucky it's not as gross as still seeing hairs on pork rind or chicken skin!